Ashton Kutcher is following in the footsteps of Alicia Keys formerly of Blackberry and Lady Gaga of Polaroid. He was just hired by Lenovo as a “product engineer.” Kutcher will be drawing from his experience as playing the role of Steve Jobs, but he was also studying biomedical engineering at the University of Iowa when he quit school to pursue his modeling career. His interest in engineering is currently more on the financial side – his venture capital group A-Grade Investments has backed Foursquare, Airbnb, and Uber to name a few. His role in Lenovo will involve design and spec inputs for future tablets, and of course, product promotion. He was last seen at Lenovo’s unveiling of its latest tablet, the Yoga Tablet in Los Angeles. The android tablet ranges from $249 and $299, and has a unique cylindrical handle for ease of grip. 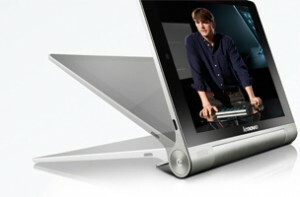 Lenovo has also used the large handle to add a longer-lasting battery and it doubles as a stand.